On this day in 2008, Jermain Defoe confessed: I didn’t realise Pompey were this good. 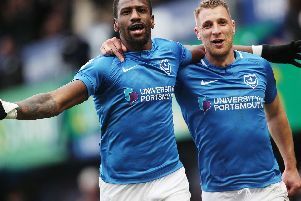 The England striker netted the winner in a 1-0 victory against Sunderland to maintain his 100-per-cent scoring record at Fratton Park for the Blues. At the time, Harry Redknapp’s men were just three points off fourth-placed Liverpool – and a Champions League spot. And the January transfer window arrival from Spurs conceded the extent of Pompey’s quality had been a pleasant surprise. Speaking to The News following the Black Cats victory, Defoe said: ‘I’m happy, I’m playing with great players, a lot of internationals, and we’re doing well. ‘I always thought the team was quality, but obviously when you play for a different team you don’t watch the players week in, week out. ‘It’s not until you join and actually train with the players and play that you realise how good they are. ‘If you just look at the quality of our players it’s not surprising we’re challenging for Europe, to be honest. Defoe was quick to hail his team-mates for seeing off the Black Cats. He added: ‘I thought Niko Krancjar was unbelievable. ‘He’s got great feet, is strong and it’s good to play with him because when you move he will find you. ‘Kanu is so strong, so relaxed and has a lot of experience.